Do you hate changes in your life? Do you like taking all the credit for your successful activities without sharing it with the people who helped you? Does the success of the others cause envy in you? Do you watch TV every day? These are some very ordinary questions but at the same time, they can suggest if you are successful or not. If the answer to most of these question is yes for you, you are probably not much unsuccessful in life… Otherwise, you might be a successful person. Do you think that this is true? I do, because success is a mindset and you will be amazed by how much alike the habits of the successful people are. That’s also true for the unsuccessful ones. But that’s good because you now know that, and you can change it. 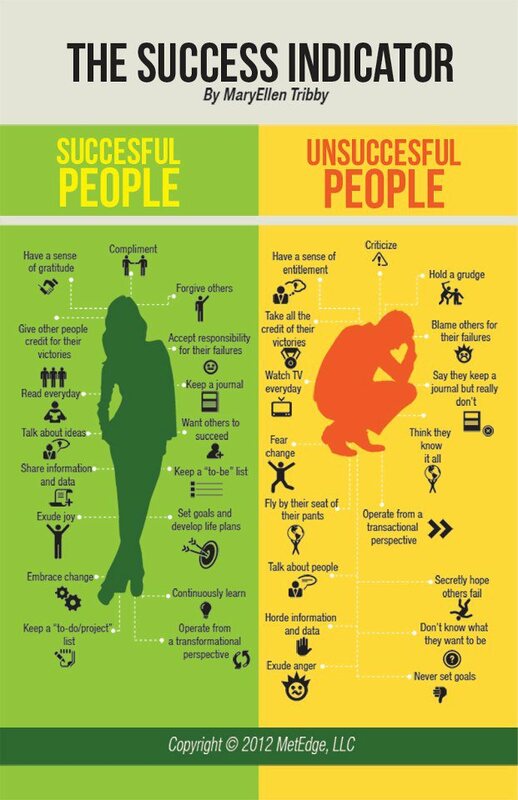 Browsing around the web I found a beautiful infographic, showing the major differences between successful and unsuccessful people. Success is not only hard work. Many people try really hard and still don’t make it. Success is also a mindset. All the people, who have made it great in business and life are hard working, want others to succeed, don’t bother their minds with negative feelings like anger, envy or hate. They all like to learn new things and take full responsibility for their mistakes. This may sound trivial, but as I am watching the picture below and I am thinking about the successful people I know, I realize more and more that all of the qualities below really make sense. I think the cool picture below, created by MaryEllen Tribby, gives some tasty food for the brain. Don’t forget to add your thoughts as a comment below. I would love to see what you think of all this. Don’t forget to share this page with friends, if you find it useful. This can be done just by a single click on the social buttons from above. Next story How To Avoid Paying High Taxes Legally. Reducing Your Tax Bills.